Now with Removable End Caps for Easier Internal wiring! 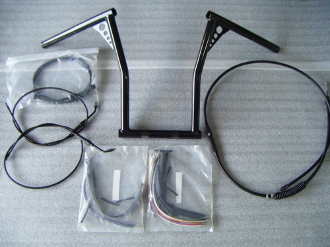 1" fits ALL HARLEY controls and late model metrics with 1" diameter handle bars. What are knurls? Knurls are a swelled diamond cut pattern on the bottom tube where the bars clamp onto your bike, that keeps them from rotating under acceleration. THIS IS A MUST ON APE HANGERS! Beware of tall handle bars offered without knurls! Our bars WILL NOT slip or rotate in your clamps! If you have a Springer, please see our other listings. Springers take a different knurling spacing.